Recently, Zimbabwe actually had to cancel its own currency. What led up to that? This entry was posted in Economics, World Hellhole Report on 08/27/2009 by deanwebb. What if the Wars Ended Right Now? How much money goes toward the wars? How many people are employed because of the wars? What would be done with all that money and manpower instead? This entry was posted in Economics, US Government on 08/26/2009 by deanwebb. This entry was posted in Economics on 08/26/2009 by deanwebb. Warren Buffet in the New York Times has a few words to say about the national debt and how it’s going to be funded. He applauds the way in which the current and former administrations managed to avoid financial meltdown. I think we can all applaud them. In spite of the mistakes, we still have an economy. However, there’s a however in this story. However part one is that the debt will be 13% of GDP, more than double any peacetime debt. However part two is that as the debt mounts rapidly, our nation loses its “reputation for financial integrity.” Translation: we may rack up too much debt for lenders to feel comfortable letting us borrow more. The next however, however, is a big, bad one. The US Government needs to borrow $1.8 trillion. Buffet’s optimistic guesses can supply $900 billion from domestic and foreign lenders. That leaves another $900 billion left to borrow from someone. If lenders can’t be found, then the only other way to get the money is to print it. Congress and the President have approved spending equal to 185% of tax revenues. That is a lot of money. Seriously. If the spending is canceled or taxes almost doubled, the recovery such as it is would have no chance of working and, worse from a Congressman’s view, his chances of re-election would be shot. Nobody has the political courage to pull a stunt like that. That means the printing presses have to run… with almost a trillion more dollars out in the world, what does that do to the value of the dollar? Mr. Buffet looks sternly at the possibility of inflation. But is that what’s really staring us down? There are other voices that are tapping Mr. Buffet on the shoulder, hoping to get him to direct his glower at the more ferocious threat of deflation. Japan’s had deflation for quite a while now and all the money they’ve printed and debt they’ve run up have still done nothing to budge their economy out of the doldrums. Japan’s economic bad turn came about as a result of a collapse in a real estate bubble. … back? OK. The US already had a massive drop in residential real estate. Now we’re looking at the coming drop in commercial real estate. Where the residential fall crippled banks that had gambled on subprime, the commercial fall will hit local banks that only gambled on enough tenants to make the projects they underwrote viable enterprises. When those enterprises falter, the economy will see massive asset devaluation. Now the trillion-dollar question: if the banks catch cold, where will be the domestic lending needed to finance the national debt? If it’s not there, then the government printing presses have to run that much harder, pushing the threat of hyperinflation all the harder. Foreign investors have already shied away from dollar-only debt purchases. That adds to the threat of really bad inflation. Maybe not Zimbabwe bad, but worse than the inflation of the 1970’s and early 1980’s. While we’re on the subject of debt, what happens if interest rates go up just a smidgen? How much more expensive will it be to just service the existing debt, let alone borrow more? This is a lot up front for my new students and, quite frankly, it’s a lot for me to sort out. That’s OK, though. The best financial minds in the world are kinda stumped about which way things are going to work out, be it inflation or deflation. There are likely other factors to consider before making a final call. This entry was posted in Economics on 08/25/2009 by deanwebb. In the study of World History, Central Asia is an anomaly. There isn’t a lot of civilization originating out of there, but a whole lot of civilizations get involved with it. It’s not really entirely part of any other region because of all the influences on it. It’s also one of the last things empires touch before they fizzle out into the shades of history. * Achaemenids: they start out with Central Asia, but it’s only a matter of time for them before Al the Great cleans their clock. * Alexander the Great: conquers Bactria, dies soon thereafter, empire collapses. * Selucids: they can’t hold the area and hand it over to the Mauryans, then get owned by the Romans. * Bactria: Does not end well for them. Overrun by nomads. Not a good way to go, at all. * Indo-Greek Empire: Conquers Bactria, then implodes due to civil war. * Han China: gets out that way, then collapses. * Islamic Caliphate… gets out that way, then the Umayyads fall and their empire collapses. * Tang Dynasty: undone after a disastrous Central Asian battle. * Mongols: Like Alexander, they take Central Asia early on, then their empire fractures and fades. * Safavids: They take Afghanistan, and then stir up a massive uprising there that results in the Afghans invading Persia and ruining the place… then the Persians rise up and destroy the empire of their Afghan rulers, conquer Afghanistan, then collapse as an empire utterly. * Durranis: Local dynasty that manages to rule for about 70 years, then collapses due to infighting. * British: They lose an entire army in Afghanistan in the 1840s and don’t take over the place until the 1880s… and then their empire starts to unravel in a series of increasingly successful independence movements. * Russia: Takes over Central Asia after running out of Siberia and Europe… completely destroyed in revolution soon afterward. * Soviet Union: Yeah, like *they* had staying power. They didn’t even last as long as the Durranis before things started to unravel for them in 1989… a collapse accelerated by their attempt to take Afghanistan. * Taliban: Nope. They did not win in Afghanistan, and they’re still ruining everyone’s day over there. * USA: oooh, this is the raw nerve… but the sad fact remains that when a nation’s soldiers are being shot at by weapons soldiers traded to the resistance for drugs, it’s not going to win that war. I admit a bit of a cavalier approach in some of my assessments… stretching points here and there… but it’s a nice survey of Central Asia, all the same. Come Visit Beautiful Central Asia: Graveyard of Empires! This entry was posted in World Hellhole Report on 08/24/2009 by deanwebb. Dude. Awesome. Meat is not murder when it’s edible art like this. 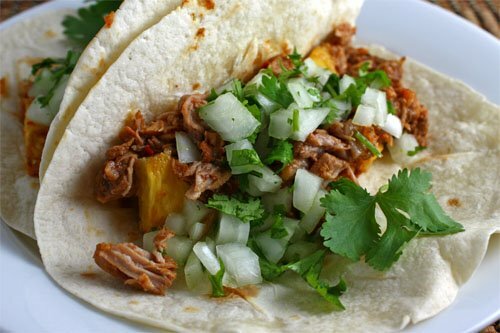 I have had over a dozen varieties of tacos al pastor and each blend of meat has been unique – even the same Taco Inn restaurant in Mexico City had a different flavor in the meat from day to day… always good, but always a subtle difference. My guess is because it’s all hand-made. There’s no huge factory pumping out some name-brand carne al pastor. Instead, there’s so many cottages producing the stuff as a cottage industry that it really is being mass-produced, just without any central direction or planning. No government, no corporation… just someone who knows how to put awesome on a vertical spit and slap it between a corn tortilla with onions and cilantro when it’s ready. I really don’t think anyone can compete with the hundreds of thousands of carne al pastor producers. Uniformity brings blandness, and carne al pastor is never, ever bland. And the tacos themselves are just a buck – or ten pesos in Mexico, which is still pretty much a buck. Forget the dollar menu at a burger joint: if you hit the taqueria, you’ll get something way more amazing than a mass-produced edible hockey puck. If you’re lucky like me and live within close range of several taquerias, the lunchtime dilemma is over which flavors to savor, not which burger to murder. Tacos al pastor… because of them, I will seriously contemplate any offer made to move to Mexico. This entry was posted in Economics, Reason to Live on 08/23/2009 by deanwebb. When a friend posted a link to a New York Times graphic gone all wrong – it labeled Arizona as Nevada and Minnesota as Wisconsin – my mind went back to another time when the NYT got the story all wrong… and won a Pulitzer for it. That’s a huge problem in humanity. We are quick to grant vast leeway and place incredible trust in those names. The worst offenders in the recent banking panic were the big “names” of Wall Street. Some of the biggest “names” among Civil War generals weren’t necessarily the best generals… but their memoirs were the most popular. We are too quick to trust in a king, a pope, or a president simply because of the position the man holds, without knowing a shred of truth about the man in that position. What’s worse are the people that help perpetuate that cult of greatness. Walter Duranty picked up a Pulitzer in 1931 for some articles that were to journalism what t-ball is to major league baseball. You can find them linked from the Wikipedia article on Duranty. For every criticism, there are a dozen praises for Stalin’s regime. Of particular note to me was Duranty’s assertion that minority problems in the USSR were a thing of the past, thanks to the overarching bonds of Communist Party unity. As Duranty wrote those, Stalin was already plotting the genocide of those minorities. His plan for the Jews in Russia was long-term: collect them in the Far East in a remote enclave on a spur of the Trans-Siberian Railroad, then sever the rail links when they were all there. They would all starve to death there. World War Two postponed that action, and Stalin’s death in 1953 canceled it entirely – but he was set to kick it off in 1954 or 1955. But there was another Holocaust that Stalin was gearing up for. His target was Ukraine, and like his plan to liquidate the Jews, involved starvation. The Holocaust of Ukraine is also known as The Holodomor. When it started, Duranty denied it was happening. After it happened, Duranty denied it ever took place – in public. Privately, he admitted up to ten million may have perished in the famine. But his private confession did nothing to tarnish the reputation of the man he had built up in order to win his Pulitzer. His public lies kept up the good PR for Stalin, when Stalin had done nothing to deserve such praise. Duranty’s reports even undermined his own paper’s editorial views on Russia. While the op-ed men wrote of Stalin’s horrors, Duranty’s ace reporting made it seem like the USSR was just a few roller coasters shy of being a true worker’s paradise. Thanks to Duranty and men that followed in his wake, we in the USA turned a blind eye to the deliberate starvation in the Ukraine and seriously contemplated becoming more like the USSR. To this day, the New York Times still keeps Duranty’s Pulitzer in its trophy case. Its own editors have since disparaged and discredited Duranty’s work and the paper hired a historian to research the accuracy of Duranty’s work. The historian found Duranty’s reporting to be so many fluff pieces on Stalin and said the Pulitzer committee should take the prize away. The Pulitzer guys, however, decided that Duranty’s reporting wasn’t deliberately misleading and that the prize should stay with the NYT. The Times shrugged its mighty, named shoulders and kept the prize, presumably against its will. Granted, the prize was awarded for a series of articles on Russia and not Duranty’s Holocaust denial. All the same, it was another case of the Pulitzer going to the best work of fiction to be passed off as news. The Times admits the reporting was terrible, but left it up to the prize committee to decide whether or not to revoke it. That’s unacceptable. I mean, how hard would it be for the Times to get some bubble wrap and a box and ship the award back to where it came from? Or if the Pulitzer committee refuses to take delivery, how about shipping it to Kiev for the next Holodomor Remembrance Day? And if they don’t want it, there’s the Holodomor Memorial in DC. The Times has many more options than sitting on its hands and keeping a Pulitzer they themselves admit has no validity. Duranty helped Stalin to tell the Big Lie time and time again – he made a name for himself in so doing. He made it possible for the Holodomor to be denied, and for those who denied it to be esteemed as plausible scholars and journalists. Worse, he showed the way for journalism to become subservient to the prevailing powers and to grow fat from the crumbs that fell off the table. Journalism needs to be about viewing the men and women in power through a critical eye and holding them to account. If the Times were to send back that prize, it would be a powerful signal that it was not willing to accept the idea of journalism as propaganda for the powers that be and that it was on the side of the powerless, who all too often wind up as pawns in the grand schemes of the rich and powerful. Or is the Times not ready to send that signal? Sure, it can distance itself from the toady reporting of the past, but is it ready to make that break in the present? Which then begs the question, how much of our news is actually news as opposed to being carefully-orchestrated propaganda? This entry was posted in World Hellhole Report on 08/23/2009 by deanwebb. I just finished watching the 2000 film, Lumumba. Devastated is the word I want to use to describe how I feel about the events depicted in it. I’ll easily concede that Lumumba made a wide range of political mistakes when he became PM of the Democratic Republic of Congo back in 1960… but there were forces trying to strangle Congo in its crib, and they were the ones that took down Lumumba. They took down a whole host of other people, including UN Secretary-General Dag Hammarskjöld. I don’t care that nobody can prove it. It’s obvious that it happened, and it needs to be said: the people behind the Katanga secession were the ones that killed Dag Hammarskjöld just as surely as they killed Patrice Lumumba. As in, that mining company I mentioned in the part of Congo that broke away was the company that sold the uranium to the USA that made the first atomic bombs. And now you know why the CIA was so very interested in the Congo back in 1960. The head of the CIA operation in Congo was one Frank Carlucci, as in the same Frank Carlucci that later served as Secretary of Defense under Reagan and also as chairman of the Carlyle Group and is the former head of Wackenhut. Carlucci swears he had nothing to do with the murder of Patrice Lumumba, by the way. Investigations into Lumumba’s murder, however, link it to that mining company, the rebel government of Katanga, and the Belgian-British interests behind the mining company. The investigations also point squarely at the CIA as having aided and abetted the murder of Lumumba. Carlucci was running the CIA show in Congo, but he swears he had nothing to do with Lumumba’s murder. So why do I mention his name? It’s because when I was watching the film, there’s a scene where the Congo government, with foreign observers sitting in, votes to have Lumumba killed. At the end of the vote, one of the ministers turns to a white guy that speaks with an American accent and asks, “Mr. BLEEEEP, do you want to cast your vote?” In the credits, there’s one actor credited with a role, but the name of the individual he portrayed is blacked out. What Carlucci can’t bleep out is that when the PM after Lumumba met with JFK, the first thing he asked was, “Ou est Carlucci?” Kennedy had no clue who Carlucci was and why the recently-installed Prime Minister of the DRC would want to see him. Technically, I can’t accuse Carlucci of having been the agent of the US government that enabled powerful mining interests to subvert democracy in a brand-new African state and murder its elected officials. It would be improper for me to suggest that Carlucci’s actions led to bloodstains on America’s honor. I could be sued if I were to state that Carlucci did something so horrible all in the interests of securing the US uranium supply and not letting it fall into the hands of the Russkies, in spite of the fact that Lumumba had first turned to the US to help his country out. Congo is a terrible mess, by all accounts. Yes, yes, there are good people there doing good things, et cetera, but it’s still a hellhole, thanks to the subversion of its democracy back in the 60’s, the US-sponsored dictatorship of Mobutu, and the lack of assistance to that nation when it went into freefall in the 90’s. The film itself is outstanding. It’s not rated by the MPAA, so I’ll give a breakdown on it: very light profanity, just one bad word, really… but it’s got a big ol’ body count. The biggest likely objection to it will come from people that think it portrays the US unfairly. I’ve been a student of the history there for some time, though, and I’m sad to report that it is quite fair in its depiction of US involvement. Just because the USA is a free nation does not mean it is immune from wicked people abusing power and having it vault their successful careers. The illegal actions of the Belgians, British, and USA all served to keep Congo’s mineral wealth from being nationalized and that meant the profits continued to flow into Belgian, British, and US hands. Dag Hammarskjöld was en route to Katanga to try and get it to settle peacefully with the rest of Congo: Harry Truman was quick to point out that Hammarskjöld had been murdered, and that his plane going down was no accident. The UN Secretary-General was getting too close to the truth, and the money men involved obviously had to have him killed. And so the money kept flowing… when Mobutu took over in 1965, thanks to more CIA involvement, he found a way to reward his friends and punish his enemies, all the while stealing foreign aid for his own benefit. The US helped him to keep crushing his rivals at home, making our nation in no small part responsible for the political vacuum that sucked half of Africa into its maelstrom when the Cold War ended and we quit propping up Mobutu. Of course, Mr. Carlucci insists he’s innocent of the murder of Patrice Lumumba. He’s got the censored film to back up his point. All I have to ask is this: if he was running the CIA mission in the Congo at the time, and the CIA was involved in the events surrounding the murder of Lumumba, what was Carlucci doing? Is this another case of being stupid if he didn’t know, and dishonest if he did? That’s all too common in US foreign policy. In the case of the Mossadegh coup in Iran, the CIA chief there was intimately involved and later couped Arbenz in Honduras. So why wasn’t the CIA guy behind Lumumba’s death? Who dropped the ball on that one? Or maybe, just maybe, Mr. Carlucci might be involved in a doubleplusungood untruth. See ya at the Memory Hole, Frank! This entry was posted in World Hellhole Report on 08/19/2009 by deanwebb. Time to Live in Hell and Rent Out Texas? Most of South and Central Texas is in a drought – no dispute about that. It’s hellacious and ferocious and there’s not much anyone can do about it but pray, which means Richard Dawkins would not be greeted kindly at a Hondo ranch right about now. OK, so it’s hot and dry in Texas during the summer. So what else is new? Maybe what we need is a bit of Dawkins’ rationalism, but ixnay on the eligionray and more to do with common sense. Y’all need to quit watering your lawns. Water is a precious resource and there’s no need to fling it on the streets, sidewalks, and yards of the state. I haven’t watered my lawn for about 12 years now. Maybe more. It’s green and thick as ever when it rains. When it doesn’t rain, it goes dormant, like it’s supposed to. It’s survived many a drought and will continue to do so because it’s got a deep root system, thanks to my never watering it. Lawns made of hoity-toity grasses serve no good purpose that rougher, tougher prairie grass can’t step in and do. The high-maintenance grass in my yard is gone. Prairie grass came on the scene and flourished. It’s not as tightly packed as Bermuda and not as lush as St. Augustine, but it keeps the topsoil from eroding and looks real nice when it rains regular. It also doesn’t need any fertilizer or pesticide. That means I get to host lots of birds in my yard because there’s plenty of good stuff for them to pick at. I don’t have any bad bug problems at all. Well, if fire ants show up, I grab the Amdro, but that’s it. I will also use chemical killers to get rid of poison ivy, but that’s it on the herbicides. Turns out, I’m green environmentally by allowing for the fact that I may be brown in a drought. I don’t mind because I know it’s better to do it the way I do in the long run. Now if the rest of y’all would get on board with this, we’d do better as a state, hear? And as for the golf greens… time to cut that out, too. Head to a rodeo or a futbol match or something more worthy of the great state of Texas. All that water could go to a much better use: our children’s future. This entry was posted in World Hellhole Report on 08/18/2009 by deanwebb. What happens when a nation gets tough on crime in a state that hasn’t recently had its prisons run by a federal judge? Massive overcrowding. In budget-strapped California, its prisons are running close to double their designed capacity. The Chino riot last August 8th was a consequence of such overcrowding, and more such riots may be on tap in the future. Federal judges are making a move to correct California’s prisons – the worst overcrowded in the nation. California has 45 days to figure out how they’re going to get their prisons to 137% of capacity. If someone had a time machine, maybe that could produce a fix. Back in 1976, California switched from indeterminate sentencing to determinate sentencing. The big difference there is that indeterminate sentencing allows for leeway – time off for good behavior, that sort of thing. Determinate sentencing means tossing ’em in the slammer and not fetching the key until the sentence is up, giving prisoners no incentive to change their ways. California went from having one of the lowest recidivist rates in the nation in the 70s to one of the highest recidivist rates in recent years – around 70% when the national average is 40%. Politicians wanting to gain brownie points with voters for being tough on crime haven’t helped the situation. Longer sentences and harsher sentencing rules led to the overcrowding. California also spends $49,000 per prisoner per year, double the national average. Given the recidivist rate mentioned above, it’s clear that the prison system in California isn’t working as intended. If it’s there to deter criminals, it shouldn’t be so dang crowded with criminals that wound up back in the system. Then the budget crisis hit. California looks set to cut $1.2 billion from its prison budget, but lawmakers don’t necessarily want to do it by releasing 27,000 inmates. So it’s got a budget cut, but no way to implement it… well, if there are more riots like the one in Chino, maybe the prisoners will solve the crisis for the state by burning down the prisons and the survivors releasing themselves on their own recognizance. Good luck with those prisons, California. This entry was posted in US Government, World Hellhole Report on 08/18/2009 by deanwebb.